A movie producer gets Aquaman to swim around the world in seven days, and Black Jack offers a half million dollar reward to the pirate who kills Aquaman. On the splash page, Aquaman is walking down a street in Hollywood and is at least a full head taller than anyone else, showing off his heroic proportions... Someone named "Hedy Hepburn" asks for Aquaman's autograph... A swimming champ asks Aquaman for swimming pointers... 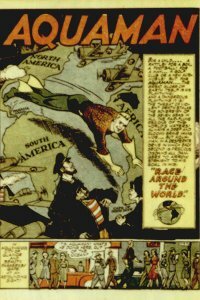 The movie studio is named Pariversal Pix and the President's name is Mr Smith... Aquaman agrees to the challenge because the profits will go to the Navy Relief Fund... Aquaman's exact route is publicized, leading Black Jack to declare the reward... Lots of inset maps so the readers could follow along Aquaman's journey. Readers got a tiny bit of geography from this one... The Japanese are horrible stereotypes, as is common in Golden Age tales. However, they are also the only group that even comes close to killing Aquaman... The pirates at the Cape of Good Hope drop depth charges on Aquaman, and he off-handedly explains how they work to his readers... Aquaman makes a baseball reference, "No hit, one error!" the pirates miss him and he sinks them instead... The Japanese capture Aquaman, hoping to use him to sink American ships... Aquaman is stuck in a muddy channel when six Japanese bombers attack him. A single American fighter arrives and shoots down two of the bombers, rescuing Aquaman, then helps him out of the mud... Aquaman makes it in less than six days, breaking all records... When asked what he's going to do next, Aquaman says he's going home to take a bath. Captured/Knocked Out report: The Japanese pirates drug the water in the Indian Ocean that Aquaman is due to swim through to capture him, but the drug wears off fast and he escapes. Special Note: This story's script is later re-used in the Silver Age, one of two instances of re-used scripts I'm certain of in Aquaman's history. When I reach that story, I'll be sure to link back to this one.